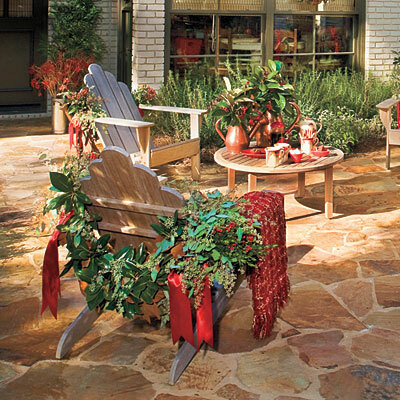 Don’t neglect outdoor patios and porches in your Christmas decorating. Don’t neglect outdoor patios and porches in your Christmas decorating. Wreaths, candles, and large glowing orbs draw guests outside to cozy up by the fire. 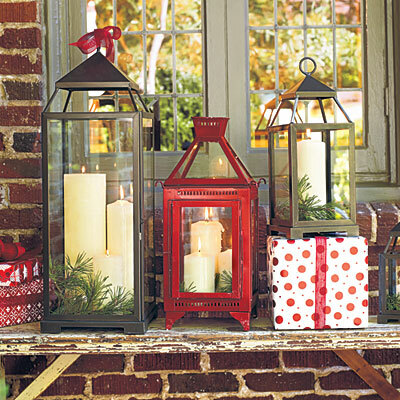 Arrange a grouping of festive lanterns at your entryway for quick-and-easy holiday style. Consider using flameless candles as a worry-free alternative to regular pillars. 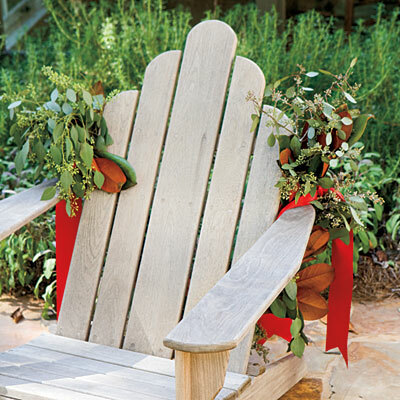 Pull elements from your home’s decor right into the center of the action by dressing up your outdoor furniture. Have throws available to let Christmas guests know you have their comfort in mind. Dress up the backs of your outdoor chairs by tying graceful swags of magnolia leaves and eucalyptus sprigs to each arm with a festive Christmas ribbon. Be sure to attach the trimmings in a manner that won’t crowd someone when seated. Hang twinkling Christmas lights on a fountain or stone wall in the garden to create a striking winter focal point from your patio or porch. 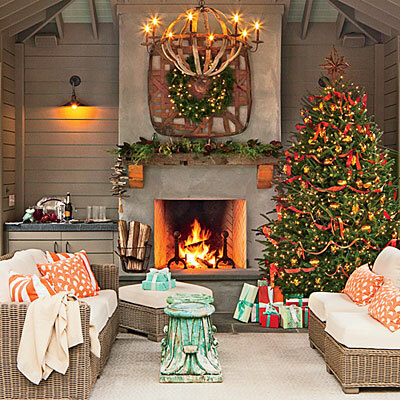 Even if it’s too cold to entertain outside, you”ll enjoy the soft cozy glow through the windows. Suspend lanterns from the underside of a patio umbrella with ribbon. Try to vary the lengths and space them far enough apart so that a passing breeze won’t knock them together. 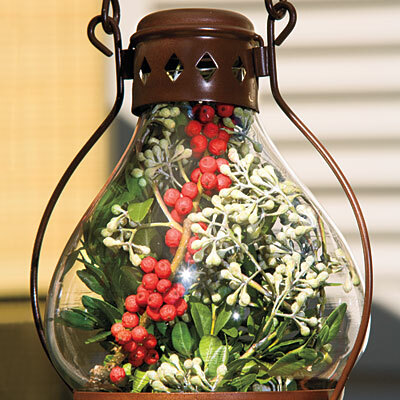 Choose natural elements such as holly berries and eucalyptus sprigs instead of candles to fill the lanterns. 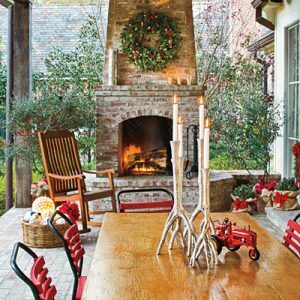 This special touch reinforces your overall Christmas decorating theme. 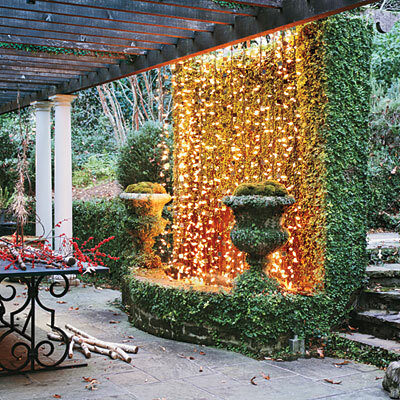 Holiday decorating doesn’t have to be a chore! Have fun with it and keep in mind the functionality of your space so that you have a good balance of comfort and decoration throughout your inviting outdoor space!